Today, Japanese restaurants with classical décor like those depicted in the Memoirs of a Geisha blockbuster no longer reign supreme. Instead, most prefer the minimalist Zen approach, with sleek glass, dark wood and steel interiors, clean-line soft furnishings, open-concept show kitchen and piped-in jazz music. Service staff is garbed not in elaborate kimonos but informal happi coats (short Japanese robe with straight sleeves) or monochromatic ensembles of white shirt and black pants. Mizu, a Japanese fine-dining eatery at the Bangsar Village, is the embodiment of this revolutionary, modern approach. Its intimidating granite and cascading water façade at the entrace gives little away of its goings-on inside. Walk through its narrow, raised passageway and you’d find yourself in an elongated L-shaped dining area interspersed with secluded corners. Noren or Japanese doorway curtains and some framed artworks underscore the outlet’s understated décor whilst its elongated sushi counter sits adjacent to an open-concept kitchen. Other features include a wine cellar, a private dining room and an outdoor patio that overlooks part of Bangsar’s busy thoroughfares. Executive chef Aspazali Amran, one of the few Malay chefs skilled in the art of Japanese cuisine, helms the kitchen team here. Having previously worked for the old Nadaman restaurant at the Shangri-la KL, Chef Aspazali shows that his 20-year experience and training stints in Japan has evolved to complement Mizu’s contemporary attitude. His innovative specialties infused with French/Continental elements, has already won him the stamp of approval from discerning corporate types and local dignitaries who frequent Mizu. Amongst them are several company bosses of Japanese corporations who hosted the Toyota F1 crew to dinner last year. Chef Aspazali’s amuse bouche of Deep-fried Maki Roll got the evening off to a rousing start. A house specialty here, it comprises sushi rice roll with minced salmon, red tuna, tobiko (flying fish roe) and mayonnaise, coated and deep-fried in crisp tempura batter. A full portion of 8 pieces costs RM15++. Many of his signature dishes are highly inspired by Tokyo’s cosmopolitan outlook. 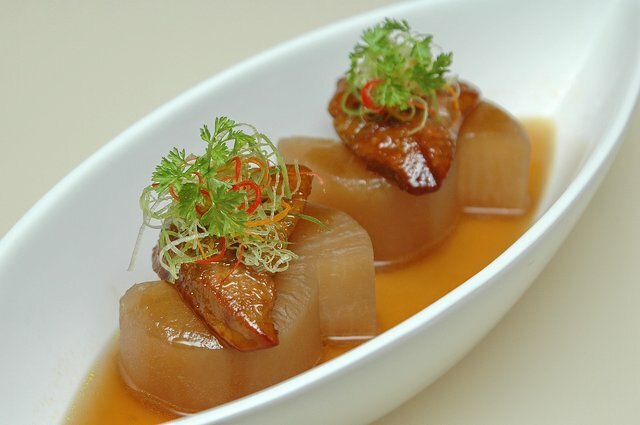 The dish of Foie Gras with Daikon (RM30++) proves how a simple, rustic dish of simmered Japanese radish can be transformed into an epicurean delight with the inclusion of pan-fried foie gras. The latter’s rich, velvety texture merged so seamlessly with the radish’s delicate sweetness that diners are unlikely to forget this sublime dish in a hurry. 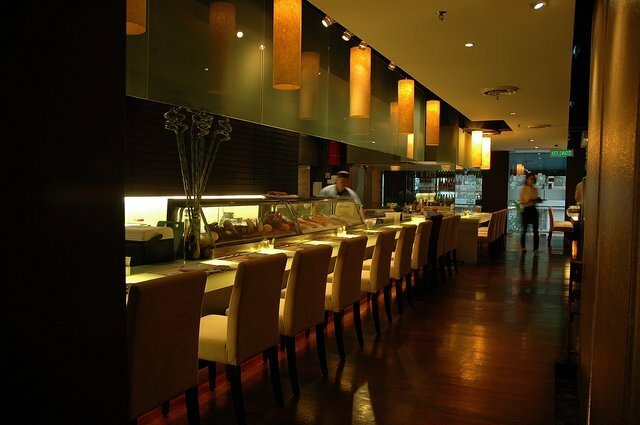 We bet the Foie Gras Chawan Mushi or steamed egg custard with foie gras (RM25++) is equally outstanding. 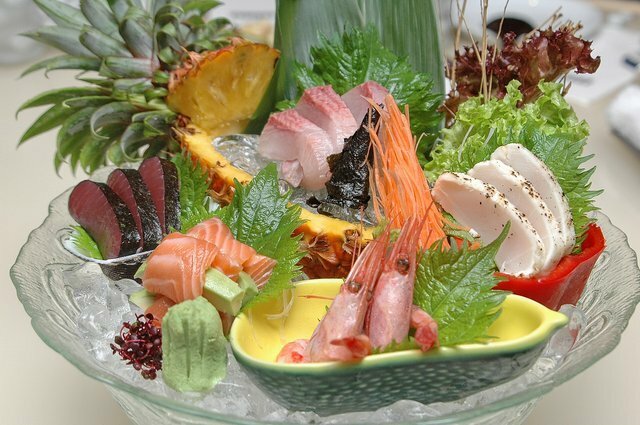 The Sashimi Platter (RM130++) is a sight to behold with succulent cuts of red and white tuna, salmon, amaebi (sweet shrimp) and yellow tail artistically presented on a tall mound of shaved ice. Flown in twice weekly, the fish’s quality and freshness is assuredly comparable to other fine Japanese eateries. For those who are averse to raw delicacies, the Mizu Maki (RM35++ for 6 pcs) is worth sampling. 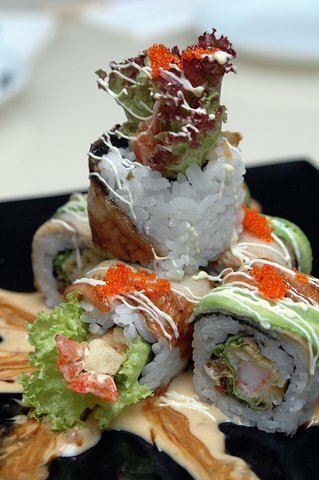 The reverse sushi roll, in which the nori or seaweed sheet is rolled inwards with the rice on outside, comes filled with sliced avocado, grilled unagi (eel), tempura prawn, lettuce and tobiko. 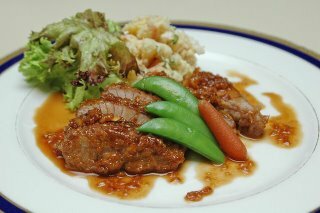 Chef Aspazali forays into fusion again with his Grilled Maguro Steak (RM35++) that looks remarkably like a luscious steak. Lightly basted with a concoction of teriyaki and garlic sauce, the tuna belly is melt-in-the-mouth tender. The creative Kedahan whose boyish looks can rival that of celebrity chef Jamie Oliver’s, certainly has no qualms about experimenting with new ingredients and techniques. 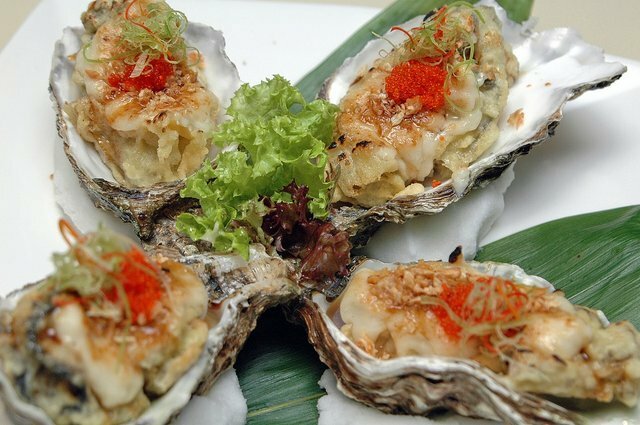 Although more Continental than Japanese, the Baked Jumbo Oyster with Cheese (RM15++ each) is certain to have you raving about it to all and sundry. Baked in its shell with grated cheese, the huge mollusk which is the size of a large sauce plate, tasted sinfully rich and indulgent. Thankfully, its accompanying dressing of light soy sauce and minced garlic prevented this speciality from being overly cloying. More edgy temptations can be found in the a la carte menu such as Marinated Fresh Salmon with Yam (RM25++), Pizza with Salted Cuttlefish (RM25++) and Spicy Seafood Mini Hot Pot with Kim Chi (RM25++). Desserts are a little more sedate with the Macha (green tea) or Black Sesame Ice-cream and freshly sliced fruits. Mizu also has a good selection of wine and saké for those who enjoy their favourite tipple to complement the culinary delights here. If the outlet doesn’t carry the desired vintage, they will try their best to procure it to ensure your next dining experience will be truly complete.